KLFC Women 3 Aldborough Ladies 0 The KLFC Women completed there league campaign today in Cromer. Needing to win to cement third place in the league for there first season playing senior women's football. They ran out 3-0 winners against a bright Aldborough team. Goal scorers: Adele Munday, Alice Coyne, Own Goal. Lynn Reserves 3 Wivenhoe Town 0 Lynn Reserves ended the season on a winning note with a comfortable win against Wivenhoe Town. The crowd on 109 had to wait until the 48th minute for the first goal - Rory Harper heading a corner onto the bar and Charlie Defty putting home the rebound. Harper turned scorer when a cross from the Lynn right found him in space and was allowed plenty of time to score. Dominic Dwyer headed home the third but Lynn could easily have scored more. Lynn: Rix, Harvey, Bush, C Defty, Leggett, Hyde, Kelly, Deadman (Fiddy 82), Dwyer, Harper (Rudd 82), Palmer (Carrick 82). KLCF Advanced U12's & U14's The KLCF Advanced U12's took on strong local club team Downham FC. Downham took a 2nil lead only to be pegged back to 2-1. The final score being 3-2 to Downham in an end to end entertaining fixture. The KLCF Advanced U14's took on Walpole FC. Walpole started the game brighter and took an early chance to go one up only for King's Lynn to reply before half time. After half time Kings Lynn started brighter and through a cross come shot went 2-1 ahead and had a chance to make it 3-1 through a penalty only for the Walpole keeper to pull off a good save. This gave Walpole the confidence to attack more and they scored a deserved penalty and breakaway goal to go 3-2 up. Lynn applied lots of pressure towards the end and struck the post but couldn't find an equaliser. Haverhill Rovers 2 Lynn Reserves 1 Lynn Reserves went down to bottom club Haverhill despite taking a 28th minute lead. A Ross Kelly free kick struck the upright and went across goal to the feet of the unmarked Rory Harper to score. The hosts were level within a minute through Shaun Banham and they scored the winner five minutes into the second half through Louis Harper. Lynn: McAnally, Fiddy (Gilchrist), Bush, Harvey, Leggett, Hyde, Kelly, Deadman, Dwyer (Rose), Harper (Parkinson), Palmer. Unused Sub : Carrick. KLCF Advanced U9's, U10's & U11's Boys At the Walks Stadium this past Tuesday the younger KLCF advanced boys squads took part in a number of friendly fixtures. The U9's took on local strong club team Wisbech St Mary and lost in an entertaining fixture. The U10's took on Downham U10's and in a fixture that is always a close affair scored with minutes remaining to win 2-1. The U11's overcame another strong local club team in West Winch by two goals to nil. KLCF Advanced U12's & U14's Girls In superb conditions the KLCF Advanced squads performed superbly well to overcome strong local club teams Clenchwarton U12 Girls and Hungate Rovers U14 Girls today. Both games where played in a competitive and sporting manor with all teams a great credit to there respective clubs. KLFC Women 3 Acle Ladies 1 The KLFC Women overcame a strong Acle team today in their debut at The Walks Stadium. Frankie Walder made her senior women's debut and put in a superb performance. The team had a number of chances in the game and finally got there rewards going 2 goals up. Acle replied only for 16 year old Shanice Burch to hit an unstoppable volley from 30 yards into the roof of the net. The team finish there league campaign next Sunday versus Aldborough Ladies. Well done to the whole team. Vauxhall Motors 1 King's Lynn 3 Lynn ended their first season in Conference North with a win. Vauxhall Motors, hit by injuries, were the victims as Lynn recorded a deserved 3-1 win. Lynn's first goal came on two minutes - and it was Adam Smith who scored it - his first of the season having been put through by Mitchell. The hosts equalised on 35 minutes - Lee Furlong finding the head of Karl Noon. With half time approaching The Motormen had already utilised both their available substitutes and on 42 minutes Lynn's leading scorer Jack Defty headed home his 13th goal of the season. Lynn completed the scoring on 75 minutes when substitutes Dom Dwyer and Ross Kelly linked up - the latter shooting home left footed for his first senior goal of the season. Lynn: Howie, Graham, Smith, Peters, Thomas, Camm, Fisk, Mitchell (Kelly), J Defty (Renton), Joachim (Dwyer), Crane, Unused Subs: C Defty, Murray. Booked: Fisk, Dwyer Keith Webb and Lee Glover depart The Walks After the match it was announced that Manager Keith Webb and assistant Lee Glover would be stepping down with immediate effect. Keith Webb took charge of the Linnets on 19th December 2006 and took Lynn to the play-offs at the end of the 2006-07 season and then promotion to the Conference North the following year. In total he took charge of 136 competitive matches, the longest someone has stayed in the hotseat since Peter Morris who was manager between 1995-98. The club wishes him and Lee Glover best wishes for the future. In an e-mail message received from Lee Glover he said: "I would just like to thank you all for your support during my time at the club. It was a very enjoyable period particularly getting promoted, although quite stressful in the last few months of this season but that's football! Hopefully the club will win the appeal and not be demoted. Cheers and good luck, Gloves." Goals by Lee Hyde and Joe Setchell gave Lynn Reserves three points in their 2-1 win at Woodbridge Town ensuring a place above the relegation area. There was disappointment for Lynn A who went down 0-1 to league champions Heacham. KLCF Advanced U11's 2 Boston United U11's 4 In perfect conditions the Lynn boys went down 4-2 to local rivals Boston United at the Walks Stadium today. The game was end to end with chances for both teams. The King's Lynn boys performed superbly in there first 11 a side fixture of the season. Needham Market 2 Lynn Reserves 0 After a goalless first half which saw very little goalmouth action Needham Market took the lead two minutes into the second half through Danny Smy Lynn had the better of the following exchanges but Needham Market went further ahead on 77 minutes through Danny Phillips. Dom Dwyer went closest for Lynn in injury time but Liam Jones made a good save. Norwich striker Kris Renton has extended his loan spell with Lynn for the rest of the season although manager Keith Webb emphasised that he will need to fight for a place in the team. Fleetwood Town 3 King's Lynn 0 Statistics can be manipulated to prove just about anything. In the space of week Lynn have gone from a six match unbeaten run to having scored one goal in three outings. You have to go back nine matches to find Lynn scoring two goals in the same game - and even then they lost. Sean Clancy was Lynn's undoing with a hat-trick and but for the heroics of Scott Howie the margin could have been greater. Lynn's best chance came some 15 minutes before the end when Jack Defty's effort was tipped over the bar. Lynn: Howie, Graham, Smith, Peters, Thomas, Camm, Mitchell (Dwyer), Johnson, J Defty, Renton (Joachim), Fisk (Kelly). Unused Subs: Crane, Murray. Booked: Thomas. Lynn Reserves 1 Haverhill Rovers 0 Lynn bagged the points in this battle with bottom placed Haverhill but the visitors could feel aggrieved that they did not get at least a point. The opening 45 minutes lacked goalmouth action with Lynn producing one effort - a Bush shot that was pushed away for corner - whilst Haverhill's only effort of note was headed wide of the post. In first half stoppage time Charlie Defty headed a free kick home from close range to give Lynn a lead they deserved for their possession. Haverhill were more of a threat in the second half - twice Lynn were saved by the bar and once by McAnally's legs. Lynn: McAnally, Harvey, Bush, Setchell, Gilchrist, C Defty, Fell (Deadman 83), Carrick, Livotti (Hyde 65), Rudd (Harper 70), Nicholls. Lynn A defeated West Lynn Social Reserves by a single goal to keep up the pressure on league leaders Heacham - who they meet at the end of the month. Lynn Reserves 2 Norwich United 2 Lynn Reserves ended a run of six defeats with a point against fellow strugglers Norwich United. A Kyle Nicholls goal three minutes from time look to have bagged Lynn all three points but the visitors equalised on 90 minutes through Lee Howlett. United had led at half time through Keith Hetherington but Dom Dwyer equalised for Lynn. KLFC Women 4 Aldborough Lions 2 With players missing due to injury the KLFC Women only had 10 players going into the game. After going 2-1 down at half time the team rallied and put in a superb performance to run out 4-2 winners. Goal scorers Tiff Forshaw 2 Stacie Newman 2. The win still gives the team an outside chance of gaining promotion in there first season of playing senior women's football. King's Lynn 1 Stalybridge Celtic 0 It all looked a little too familiar . . . Lynn leading 1-0 and into time added on. Stalybridge won a free kick in a very useful central position just outside the box. It all looked part of a script. Torpey struck, Howie dived but was beaten - but the ball hit the upright. Lynn went down the other end and tried to use up the seconds remaining. Jack Defty, trying to hold the ball in the box, was fouled and took the penalty himself - but his attempted chip went over the bar. It was the last kick of the game and Lynn's record is now just one defeat in ten games. The first half belonged to the visitors and Scott Howie made important stops from a Lee Ellingtyon free kick and a long range effort from Hardicre. Lynn's first half attacks often ended with an offside flag - the best of their attempts being a Jack Defty shot which went wide. The second half began with the early exchanges even. Then on 59 minutes Lynn replaced Kris Renton with Julian Joachim and with three minutes Lynn were in front. A mistake by Celtic centre-half Bowler allowed Joachim to race through to chip the ball over the advancing Phillips. A chance to double the score came when Hardicre's error allowed Joachim to break through into a one-on-one situation with the keeper but he put the ball just too much in front of him and Phillips dived. Howie was again Lynn's saviour when he denied Ellington and with time added on arriving Lynn fan's wondered what to expect. But this time, apart from Defty's last kick, they were not disappointed. Lynn: Howie, Graham, Smith, Peters, Thomas, Camm, Fisk, Johnson, J Defty, Renton (Joachim 59 mins), Mitchell. Unused Subs: Dwyer, Kelly, Crane, Murray. Booked: Thomas Att: 962. Today's fixture for the reserves at Haverhill Rovers was postponed due to a waterlogged pitch. Lynn A went down 3-1 at Ingoldisthorpe. Lynn Reserves 1 Dereham Town 3 Dereham Town gained revenge for the defeat inflacted on them at Aldiss Park in late December. Lynn Reserves fielded Julian Joachim, Andrew Fisk and Jack Defty in the starting line-up but were 2-0 down at half-time, Simon Mowbray and Danny Beaumont scoring. In the second half Murray denied Barrett from the penalty spot but Simon Mowbray headed home from the resultant corner. Martin Rudd got a consolation for Lynn in the closing stages - heading home from close range after Fisk had guided Kelly's corner towards him. Hyde United 0 King's Lynn 1 Lynn completed their first Conference North double with an injury time goal from Andrew Fisk. Most of Lynn's first half chances came from Adam Smith corners. Mark Peters had a header cleared off the line whilst Thomas saw his header hitting Kris Renton and being deflected away. Dominic Dwyer again looked dangerous, his best first half effort coming just before half-time when, through on goal, he was bravely denied by home 'keeper Elliot Bernstien. Hyde had their chances with Farrell Kilbane heading over the bar and Tom Manship missing a good chance when delaying his shot. Just before half-time Chris Simm's low shot was saved by Howie. Berstein was again on hand early in the second half - thus time denying Scott Mitchell. Hyde began to apply pressure but many of their shots were off target. When their accuracy improved Lynn's defence blocked their efforts. Johnson's 30 yarder forced a good save from Bernstein whilst Howie was twice called upon to keep out the efforts of Daniel Douglas-Pringle Then came the decisive goal. Dwyer squared the ball to Mitchell whose shot was blocked - but it fell to Andrew Fisk to shoot home from 10 yards. Lynn: Howie, Graham, Smith, Peters, Thomas, Camm (C Defty), Kelly (Fisk), Johnson, Renton (J Defty), Dwyer, Mitchell. Unused Subs: Crane, Murray. Att: 305 Website: www.hydeunited.com Lynn Reserves 0 CRC 1 A 12th minute goal was enough to settle the destination of the league points. It was no surprise when it came as the Reserves had already had two escapes from attacks down their left flank. The remainder of the first half belonged to Lynn but they were unable to penetrate the visitor's defence whilst CRC still looked dangerous on the break. The second half was an even affair with both sides having chnaces. Lynn: Norris, Gilchrist, Setchell (Deadman), Harvey, Hyde, Leggett, Fell (Bush), Watts-Sturrock, Harper, Rudd (Carrick), Nicholls. Unused subs: Fiddy, Rix. Booked: Harvey. Lynn A defeated Gaywood 4-0 to keep up the pressure on league leaders Heacham. Acle Ladies 1 KLFC Women 1 The Kings Lynn FC Women travelled to Acle Ladies today and came away with a creditable draw. Goal scorer Tiff Forshaw. Best wishes go to Alice Coyne and Carolyn Flowerdew for speedy recoveries from injuries they sustained in recent fixtures. Lynn 1 Vauxhall Motors 1 Lynn have conceded goals in the last fifteen minutes of five of the last six matches - only against Redditch did they manage to hang on to all three points. Another record they might prefer not to have is that they have equalled the number of drawn games they achieved when they made their Northern Premier League debut - just one more and it will be a new record, and on today's performance that draw should not be long coming. This was a match that had little to offer. Two virtually identically goals: the first on 30 minutes when Adam Smith took a free kick and Dom Dwyer got his head to it. Then into stoppage time Tom Hannigan headed home from another free kick - this time the post helping the ball into the net. There were a few bright points - Renton's running and his back-heel to set up Scott Mitchell for a run, Dom Dwyer's energy, and his constant threat to the visiting defence. Kris Renton had a goal disallowed on 57 minutes for a hand ball in the build-up but neither goalkeeper made a serious save all afternoon. Next up is Hyde United - Lynn's last chance of a Conference North double but against a team fighting relegation - another draw anyone? Lynn: Howie, Graham, Smith, Peters, Thomas, Camm, Mitchell (C Defty 80), Johnson, Renton (Crane 87), Dwyer, J Defty (Kelly 56). Sub (not used): Murray. Booked: Dwyer A Robert Carrick goal was not enough for Lynn Reserves who went down 1-3 at Tiptree United whilst Lynn A made League Cup progress with a 2-0 win over Lynn Docklands. Lynn Reserves 1 Ely City 2 A goal by Stephen Harvey was too little too late for Lynn Reserves. By that time they were already 2-0 down and reduced to ten men having had Daryll Rose red-carded. Solihull Moors 1 Lynn 1 It isn't that Lynn concede more goals in the last fifteen minutes of the game than at any other time - it is just that they seem to have the ability to do it when the scores are close. In six games which have resulted in draws this season, Lynn have conceded in the last quarter hour. And so it was at Solihull. Lynn had taken a 55th minute lead through Bradley Thomas who back healed his first league goal of the season after the home defence had failed to clear an Adam Smith free kick. Then, for the second consecutive match, Lynn conceded in time added on, Solihull substitute James McPike scoring on the counter attack. Lynn, without Jack Defty (who was working away), had the better of the goalless first half chances with Dominic Dwyer being denied by the home keeper and Andy Johnson grazing the post. Lynn continue to look for their first Conference North double with Vauxhall Motors (who they play for the first time on Saturday) and Hyde United being their only remaining chances. This was Lynn's seventeenth draw of the season, currently one less than they managed in their first season of Northern Premier League football back in 1980-81. With nine matches Conference North matches remaining it looks likely that this record will be broken. Lynn: Howie, Graham, Smith, Peters, Thomas, Camm, Mitchell, Johnson, Dwyer, Renton (Crane 87), Fisk (Kelly 69). Unused subs: C Defty, Murray. AFC Telford 1 Lynn 1 Lynn got a point against high-flying AFC Telford in what was a drab affair. Both clubs had to make changes to their line-ups at relatively short notice - Lynn losing two players during the week and Michael Frew on Friday whilst Telford were without leading scorer Terry Fearns. In a forgettable first half neither side managed a worthwhile shot on target, a Carl Rodgers effort for the home side just before half-time being the closest. The home side increased the pressure in the second half and when Lynn took the lead it was against the run of play. A Telford corner on 81 minutes resulted in a scramble in the away goal but Lynn cleared and Jack Defty set up substitute Dominic Dwyer to break free of the home defence and give Lynn the lead. Lynn's first every away victory in 11 games against Telford was denied, however, when Danny Carey-Bertram equalised in stoppage time from close range. Lynn: Howie, Graham, Smith, Peters, Thomas, Camm, Mitchell, Johnson, J Defty, Renton (Dwyer 76), Fisk. Unused subs: Kelly, C Defty, Crane, Murray. Booked: Johnson, Graham Att: 1,990 Lynn Reserves 1 Mildenhall 3 A second half penalty miss from Rory Harper helped Mildenhall to their first win in six matches. The visitors took the lead when ex-Linnet Stephen Spriggs' cross was eventually turned in by Tom Youngs. Lynn drew level on 15 minutes through Kyle Nicholls. Rory Harper was brought down by Matty Paynter at the beginning of the second half but the keeper, making his debut, made amends from the spot kick. Mildenhall took the lead just past the hour - Spriggs again crossing with John Sands scoring from close range. On 75 minutes Sands completed the scoring after a long run into the Lynn half. Lynn A won 3-1 against Narborough to stay second in the league, one point behind leaders Heacham with a game in hand. Michael Frew Departs The club wishes to announce the departure from the club of Michael Frew. Michael has received a substantial offer from another club which he felt, at this time in his career, was too good to turn down. We thank Michael for all of his past efforts for the club over the last three seasons and we wish him well for the future. Kris Renton arrives on loan Although Lynn no longer have the services of Ben Chapman and Joe Francis to call on, joining the squad will be Norwich striker Kris Renton on an initial month loan. The 18 year old Scottish striker scored a stunning goal against the Linnets in a pre season friendly at the Walks and is a highly rated member of the Carrow Road squad. King's Lynn Football Club wishes to place on record its great thanks to Norwich City Football Club and their manager Mr Bryan Gunn in their help in bringing Kris to the Walks. Norwich City were very keen to assist us on this matter and we greatly appreciate their assistance in completing negotiations swiftly. All of the necessary paperwork has now been completed and Kris will be in Keith Webb's squad for Saturday's trip to AFC Telford. Renton has scored nine goals in 11 academy starts for Norwich this season. The Scot was the youngest-ever Norwich debutant when he appeared as a substitute for the Canaries' first team at Leicester in 2007. He signed a two-year professional contract with The Canaries in the summer of 2008. Club Statement The club last night had a clear-the-air meeting with the players to discuss the club's well documented current financial difficulties. Back pay and wages going forward were the sole topic: some players who are already talking to other clubs have indicated that they wish to leave whilst others such as captain Andy Johnson and defender Mark Peters have stated that they will stand by the club whilst the directors continue to talk to other prospective investors. The club wishes to thank those players for their understanding and recognition of the current financial climate and dedication to King's Lynn Football Club. The club would also like to thank those that leave for their past efforts. Lynn Reserves ended at the wrong end of a nine goal thriller in this Norfolk Senior Cup final rehearsal. Three goals down in 30 minutes Lynn pulled a goal back through Kyle Nicholls before Andy Key restored the three goal margin early in the second half - completing his hat-trick. Lynn never gave up and two further goals from Nicholls and a Rory Harper free-kick making it four made for an exciting finish. Linnets announce second new director The club wishes to announce today that Mr Simon Pomfret has joined the board of King's Lynn Football Club. He will also become the club's commercial director. Simon is the managing director of Spirals, a successful business improvement consultancy working for a number of high profile clients based across the United Kingdom. Simon is also taking on the roll as the club's commercial director. This will see him becoming responsible for all commercial activities within the club. "I am looking forward to joining the board of King's Lynn Football Club and also to help the club move on to the next level", confirmed Mr Pomfret on Monday afternoon. Lynn 0 Hucknall 0 Lynn are still looking to complete their first Conference North double as strugglers Hucknall Town claimed a point in a game low on entertainment and scoring chances. In a dull first half the highlights were a Joe Francis free kick which required a save from visiting 'keeper Lindley. It was the visitors, however, who had the most noteworthy of the first half chances. Wilson volleyed over on the half hour and then Ricketts headed over after Smith had lost possession. An effort from Bacon struck Howie's legs and the follow-up was scrambled away for a corner as the visitors looked most likely (if any) to score. The second half was almost as dire as the first - although it was Lynn who had slightly the more chances but Hucknall came nearest to scoring. For Lynn, Adam Smith was just wide of the post and Frew's run down the right wing ended with his cross-shot going over. Francis' diving header went wide and Jack Defty had an effort blocked by Meikle almost on the line. For Hucknall, Bacon was denied by Howie who then went on to stop an effort by Ricketts. The best save of the game came from Scott Howie who tipped Wilson's goal bound curling shot away for a corner. The introduction of Dom Dwyer for Lynn came as a breath of fresh air and he caused problems in the Hucknall defence setting up Jack Defty who shot over and then putting in a left foot effort which was held by the keeper. Lynn: Howie, Graham, Smith, Peters, Thomas, Camm (Kelly 82), Frew (Dwyer 75), Johnson, J Defty, Francis, Mitchell (Fisk 68). Unused subs: C Defty, Murray. Lynn Reserves were without a game whilst Lynn A won 2-1 against Lynn Docklands. Gavin Hurren Departs Gavin Hurren has left the club and joined Conference National outfit Crawley Town. Hurren was signed by the Linnets from Mansfield Town in January and made just two starts. It is expected that he will go straight in to Crawley's squad for their weekend fixture. All at The Walks wish Gavin well for the future. King's Lynn 2 Harrogate Town 3 Lynn's ability to lose a two goal lead once again showed itself as their mini-revival ended with Harrogate completing the double. The first half offered little in terms of goalmouth action - Scott Mitchell's 13th minute header from Michael Frew's corner was hacked off the line was one of the few chances that was on target. Whilst Lynn might have claimed to have shaded the first period the opening 15 minutes of the second half belonged to Harrogate and it was against the run of play when Lynn took the lead. Jack Defty put the ball behind the Harrogate defence and Frew ran on to it - his first shot was stopped by Harrogate keeper Hedge but Frew was the first to regain his composure to roll the ball home. Five minutes later Joe Francis extended Lynn's lead. Francis made progress down Lynn's left flank and after a quick pass to Mitchell was on hand to score left-footed from eight yards. Minutes later Francis had the opportunity to put the game beyond doubt but shot into the side-netting. Harrogate pulled a goal back on 74 minutes - James Dean out-muscling Peters to score from close range. Two minutes later the visitors were level - Nathan Peate curling a free kick from the edge of the box over the two-man wall and to the far side of Rob Murray's goal. An off the ball incident spotted by the referee's assistant resulted in Dean being sent off but the reduced numbers did not stop the visitors. Richard Marshall got the winner from eight yards with five minutes remaining. Lynn gave a late debut to Dominic Dwyer who did have time to get a stinging shot on target but it went straight to the keeper as the shell shocked Linnets fell to their fourth home league defeat of the season. Lynn: Murray, Graham, Chapman (Dwyer 88), Peters, Thomas, Camm, Frew, Johnson, Defty, Francis, Mitchell. Subs not used: Hurren, Smith, Fisk, Howie. Booked: Defty, Chapman, Peters. Goals: Frew (62), Francis (67) Lynn Reserves won the local derby against Wisbech. Lynn took the lead on two minutes through Rory Harper and this was doubled ten minutes before half time by Ross Kelly. Three minutes later an own goal brought Wisbech back into the game. An injury to Wisbech keeper Chris Horton resulted in him being taken to Lynn hospital. The King's Lynn FC wishes him a speedy recovery. Redditch United 1 King's Lynn 2 Two goals from Jack Defty gave Lynn their first away league win since early November. On five minutes Michael Frew was brought down in the penalty area by fullback Charlton and Jack Defty scored from the spot. On 12 minutes Lynn added a second. Home 'keeper Lewis handled outside the area in a bid to stop a charge from Julian Joachim and from Frew's free-kick Jack Defty headed home at the back post. In a disappointing second half the home side pulled a goal back on 78 minutes from the penalty spot - Beswick scoring after Thomas had pulled down Smith. Redditch were reduced to ten men after Robinson was dismissed after an altercation with Thomas. Lynn: Murray, Graham, Chapman, Peters, Thomas, Camm, Frew, Johnson, J Defty, Joachim, Mitchell (Smith). Unused Subs: Hurren, Fisk, Francis, Howie. Att: 332 Lynn Reserves' biggest gate of the season saw them take on League leaders Lowestoft Town. Two goals in the opening seven minutes made it look as though The Trawlerman would be on target for a similar scoreline to that dealt out when Lynn visited Crown Meadow. On two minutes Russell Stock fed Gary McGee who slipped the ball past home keeper Tom Rix. And, in a similar move five minutes later, ex-Linnet Stock repeated the act. 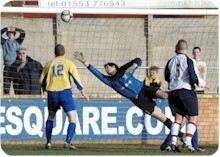 It could have been three but Tom Rix produced the save of the season to tip Richard Woodrow's shot onto the crossbar. Lynn fought back and on 25 minutes Charlie Defty's left footed shot from 12 yards made it 2-1. Two further saves from Tom Rix denied Lowestoft in the second half but it was a good performance from Lynn given the disastrous start. Lynn A booked a place in the Final of the Norfolk Junior Cup at Carrow Road with a 4-2 win over Gorleston Reserves. They meet Norwich St John's of the Anglian Combination Division Two in the final on 24 March. Press Release King's Lynn Football Club are pleased to announce the appointment of Mr Neil Featherby as the club's Director of Football. Neil is a well known and respected figure in Norfolk sport and is owner of the successful Sportslink company. Final procedural checks are also taking place at the moment on a second person who also wishes to join the club's board. And on Monday club chairman Mr Ken Bobbins will be meeting with a third person who it is hoped will join the board as a financial director having already expressed an interest in becoming a director. On Tuesday representatives of two of the biggest projects currently being undertaken in King's Lynn will meet with club officials to discuss developing possible links with King's Lynn Football Club. The club wishes to clarify this exciting news to its supporters and to keep them fully up to date with these developments. Lynn 0 Southport 0 Despite the snows of Thursday evening the game went ahead - all credit to those volunteers who helped ready the ground this morning. For the third time in four meetings at The Walks Lynn and Southport fought out a goalless draw. It was a fair result. Lynn had the better of the first half chances. Jack Defty's volley on nine minutes was denied by a finger tip save from Southport 'keeper Tony McMillan. The first twenty minutes belonged to Lynn but then the Sandgrounders began to settle but Robbie Booth's header went straight into the arms of Rob Murray. Further chances fell to Scott Mitchell and Julian Joachim but they were denied by McMillan and Shaun Gray respectively. Just before half-time Steven Daly spurned a good chance for the visitors when he blazed over from six yards. Second half chances were at a premium. Joachim took adavantage of a miscued goal kick but it went straight at McMillan whilst Ben Chapman headed an Earl Davis' header off the line on 78 minutes as the visitors began to apply pressure. Rob Murray got a hand to deny a Mark Duffy free kick whilst Mitchell picked up a loose ball and burst through but fired over with just the 'keeper to beat. Lynn: Murray, Graham, Chapman, Peters, Thomas, Camm, Frew (Francis 60), Johnson, Defty, Joachim, Mitchell. Subs (not used): Hurren, Smith, Fisk, Howie. Booked: Chapman, Frew. Att: 972 Lynn Reserves will be at Carrow Road on Wednesday, April 15 in the final of the Norfolk Senior Cup thanks to a 6-1 win at Gorleston. Reg Davies It is with great sadness that the club learnt of the death of Reg Davies in Australia at the age of 79. Reg Davies was Lynn player-manager from December 1965 to November 1970 Reg's managerial record at The Walks was - played 265 games, 170 wins, 75 draws and 120 defeats. As a player he made 217 appearances, scoring 29 goals. During his time in the hot seat the club won the East Anglian Cup (three times) and the Eastern Floodlit League. Reg was succeeded by former Tottenham and Arsenal defender Laurie Brown on 30 November 1970. A testimonial match against a Cambridge United XI was staged in 22 Feb 1971. Although his parents had a show-business career in mind for him he started in non-league with Cwm Athletic near Swansea and signed amateur forms for Southampton in the mid-1940s. After National Service he joined Southend in 1949. Davies signed for Newcastle for �9,000 making a scoring debut for the Magpies in a 3-1 home victory over Wolverhampton Wanderers in October 1951, During his time there he scored 50 goals in 170 games. In October 1958 Davies joined Swansea Town and subsequently went on to play for Carlisle United, and Merthyr Tydfil from who he joined Lynn. In 1971 he emigrated to Perth, working as player-coach with Bayswater United and Ascot, guiding them both to major trophies. He appeared for Western Australia against New Zealand when he was 47, and played at a high standard into his 50th year. Davies made his full international debut against Scotland 18 October 1952 making a total of six appearances for Wales. The club sends its condolences to his wife and three children. Michael Chinn Steps Down The club has to announce that for personal reasons Michael Chinn has resigned as a director of the club with immediate effect. The directors, and we are sure, all people concerned with the club would like to thank him for his tremendous help over the past two years and wish him all the best for the future. The club is also inviting anyone that might wish to involve themselves as a director, with a view to help push the club forward, to contact the club. Fakenham Town Ladies 1 King's Lynn FC Women 14 The Kings Lynn FC Women continued their recent good form with a comprehensive away victory at Clipbush Park home to Fakenham Town FC. Goalscorers: Tiff Forshaw 8, Nikki Jay 2, Alice Coyne 1, Shanice Burch 1, Chloe Burch 1, Stacie Newman 1. Player of the Match being Chloe Burch. The women will look to take this form onto next Sunday when they travel to Aldborough Ladies. King's Lynn 2 Gateshead 0 Lynn's recorded their first win of 2009 and it was deserved as they rarely allowed the division's hot-shots a glimpse of goal. A goalless first half saw Lynn with the better of the goalmouth action. Julian Joachim put over when under pressure and Michael Frew had a good opportunity when presented with a choice of shooting or setting up Jack Defty - and the resultant kick was neither. Then Jack Defty had a header that went just over. Gateshead were quick on the break - many of these starting with long throws from 'keeper Paul Musselwhite. Lynn, however, with Mark Peters back in defence for the first time since October, gave the division's leading scorers few chances. The second half saw more of the same with Lynn showing more passion than against Blyth Spartans the previous week. The opening goal, on 56 minutes, came from Frew on Lynn's left with the ball first glancing off the head of one Gateshead defender and finding that of a second, Matt Hocking, who put the ball just inside the post. Gateshead came more into the game and for a time Lynn seemed unable to clear their lines - each clearance coming straight back to them, but Lynn weathered the storm. Musslewhite stopped Lynn going further ahead when he got a hand to Peters close range header but Lynn made sure of the points on 83 minutes - Michael Frew's free kick fell toward the near post and Luke Graham was the first to react and prod home. Lynn: Murray, Graham, Chapman, Peters, Thomas, Camm, Frew, Johnson, Defty, Joachim, Mitchell. Subs (not used): Hurren, Smith, Francis, Fisk, Howie. Booked: Mitchell. Att: 966 Elsewhere Lynn Reserves went down 4-2 at Harwich & Parkeston. Rory Harper's 8th minute goal gave Lynn an ideal start but everything changed midway through the second half. Darren Bethell scored the first of his three goals with a over-head kick and then Head's cross was deflected into the Lynn net by Kevin Leggett. Bethell scored his second when Leggett's back header fell short but Lynn pulled a goal back through Kyle Nicholls. Two minutes from time Bethell completed his hat-trick from the spot after a penalty was given for hands. Lynn A won 7-0 at Terrington, scorers Liam Somerton 3, Rob Carrick 3 and Jordan Penty. Steve Norris was presented with his England squad number last night at a formal dinner hosted by the Chairman of the England Schools FA. The pleasing news is that he has been awarded the honour of the No.1 shirt which he will keep all season. Steven's reserve, who gets the No.17 squad number, will be Tom Pass who is on the first team books at Blue Square Premier side Forest Green Rovers. Another testament to Steven's quality! Hockering 0 KLFC Women 8 Kings Lynn FC Women got back to winning ways with a convincing 8 nil away victory. Goal scorers: Alice Coyne 3, Tiff Forshaw 3, Adele Munday, Own goal. King's Lynn 2 Blyth Spartans 3 "Dire" and "Abysmal" were words used by manager Keith Webb following this defeat. Even the magic of a Jack Defty goal could not salvage a point as Lynn conceded three goals before deciding to show anything like a competitive edge in this game. Lynn had one shot on target in the first half - that coming from Julian Joachim and going straight to the keeper's arms. One effort hoisted into the area by Crane hit the post but Frew put his chance well over. Blyth should have taken an early lead when Webster was put clean through but with the goal at his mercy a poor finish went high over Murray's crossbar. It was no surprise when then visitors took the lead on 16 minutes. A free-kick conceded by Graham resulted in Pell heading home. Lynn did seem to come more into the game as the first half progressed but when a poor pass from Smith to Chapman resulted in the latter slipping, the way was open for Walton to add a second. Lynn introduced Jack Defty at half time with Michael Frew taking the right side in place of Andrew Fisk. Lynn looked more of a force going forward but on 53 minutes they were 3-0 down. Dale crossed low on the Lynn right to give Walton an easy side foot home. Lynn pulled a goal back on 63 minutes when a Frew corner came back to him and his cross found the head of Jack Defty. Two minutes later and it was 3-2. Once again Jack Defty was involved - setting up Joachim who took his chance well. At long last Blyth were on the ropes but Lynn could not force the equaliser and the visitors weathered the storm. Frustration took over and Crane was sent off in the final minutes after retaliating having been fouled by Pell. The performance and result somewhat overshadowed the debut of Andy Johnson who showed some good touches - and these will be needed as Lynn face the top two teams in the next week. Lynn: Murray, Graham, Chapman (Francis), Thomas, Crane, Hurren (Mitchell), Fisk (J Defty), Johnson, Frew, Joachim, Smith. Unused Subs: Camm, Howie. Booked: Thomas, Smith, Francis, Mitchell. Sent off Crane. Attendance 1041. Greg Crane will be suspended for four matches which will mean him missing the games against Solihull, Southport, Redditch and Harrogate. Elsewhere Lynn Reserves got a useful point at Kirkley and Pakefield - by all accounts Kirkley's first goalless home draw since they entered the league five years ago. Lynn: Rix, C Defty, Bush, Harvey, Spittlehouse, Leggett, Kelly, Setchell, Dwyer, Harper, Osborn. Subs: Nicholls, Deadman, Fiddy, Gilchrist, Norris Lynn A progressed in the League Cup with a 3-2 win over Sandingham, scorers McCarthy, Carrick and Somerton. One In - One Out Ben Sedgemore departs This morning mid-fielder Ben Sedgemore has been released by the club. We wish to thank Ben for all of his efforts whilst with us at The Walks and we wish him well for the future. Andy Johnson arrives Lynn have signed former Norwich City, Nottingham Forest, Leicester and West Brom midfielder Andy Johnson. A former England Youth international Johnson, 34, joined Norwich as a trainee and captained the Youth side going on to make his first team debut against Sheffield Wednesday in April 1992. In the years that followed he made a total of seventy-five appearances for the Canaries, scoring 14 goals. July 1997 saw a transfer to Nottingham Forest for �2.2 million and it was while with them he made his international debut for Wales (being eligible via a Welsh grandmother). In August 2001 financial problems at The City Ground resulted in all the Forest players being transfer listed and Johnson eventually moved to West Bromwich for a �200,000 fee in September 2001 having made a total of 128 appearances for Forest. The following seasons saw the Baggies promoted, relegated and once more regain Premiership status during which time Johnson made 143 appearances scoring 8 goals. June 2006 saw Johnson sign for Leicester City where he stayed until the following May having made 21 appearances, scoring once. Johnson then signed for Championship side Barnsley in June 2007 where he stayed until his release in January 2009 having taken part in five games - his last first team appearance being in September 2007. Johnson held talks with Blue Square Premier outfits Kidderminster and Rushden & Diamonds before opting to link up again with Lynn manager Keith Webb. The club wishes to thank Neil Featherby and Sportslink in their assistance in completing this deal. (Appearance stats from www.soccerbase.com) In the Norfolk Junior Cup Lynn A will play at home to Gorleston Reserves the tie to be played on Saturday 14th February. Simon Weaver released Simon Weaver has been released by the club. A regular in the side at the start of the season Simon has been out of the team in recent weeks and it was felt by both club and player that a move to another club would be in the best interests of both parties. King's Lynn FC wish to place on record its thanks to Simon for his efforts in his time as a Linnet and we wish him well for the future. Farsley Celtic 1 King's Lynn 1 A scrambled injury time goal denied Lynn victory at Farsley. In an even first half Lynn possibly had the better of the chances - Michael Frew possibly getting the best on 36 minutes but mis-cueing his effort. Lynn, however, took a deserved lead on 76 minutes when first Julian Joachim and then Frew saw shots blocked before the ball fell to Andrew Fisk who scored with a hard, low drive from 15 yards. The home side fought back and just as it looked as if Lynn would grab the point a stoppage time melee in the Lynn goalmouth resulted in substitute Scott Broughton getting the final touch as the ball was forced home. Lynn continue with the record of not having beaten a team above them in the league or losing to a team below. The latter record will be tested next Saturday when Blyth Spartans, without an away win in the league but a good FA Cup run behind them, visit The Walks. Lynn: Murray, Graham, Chapman, Thomas, Crane, Camm, Fisk, Hurren, Frew, Joachim, Smith (Francis). Unused Subs: Weaver, Kelly, Dwyer, Howie Elsewhere a goal in each half from Osborn and Nicholls saw Lynn Reserves to a 2-0 win against Woodbridge Town and reach their highest league position of the season. 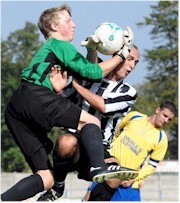 At Marlingford, Lynn A progressed to the semi-final of the Norfolk Junior Cup with a 2-1 win. Gavin Hurren The Linnets have this lunchtime completed the signing of mid field player, Gavin Hurren, from Mansfield Town. The player is a strong mid fielder and is expected to go straight in to Keith Webb's squad for Saturday's visit to Farsley Celtic. Hurren has signed a deal to stay at The Walks for the rest of the season. A former Nottingham Forest trainee Hurren joined Kidderminster Harriers in 2005 and went on to make over 90 appearances. He has made nine Conference starts for Mansfield this season plus a further five as used substitute scoring once. Reserves lose - Whitton United withdraw Lynn Reserves went down 1-2 to Kirkley & Pakefield despite taking a first half lead through Dom Dwyer. Luke Graham It has been confirmed by the club today that Luke Graham will remain at the Walks on loan from Kettering Town for the rest of the season. King's Lynn 1 AFC Telford 1 Lynn got a deserved point and might have claimed all three but for some important saves from visiting keeper Young in a niggly game. There was little goalmouth action in the first half - the best chance falling to Lynn on 41 minutes when Joachim's header from a Smith free kick was tipped over by Young. Lynn dominated the early stages of the second half with Jack Defty forcing Young into another fine save. Telford's best chance fell to Carey-Bertram but he blazed over from six yards with only Howie to beat. When Telford took the lead on 80 minutes it looked to be rough justice for Lynn. Andy Brown bundled the ball home with his knee from close range. With four minutes remaining in a game littered with free kicks, Defty was fouled and the free kick eventually fell to substitute Turner at the far post whose push-back was put into the net by Graham from two yards. Lynn: Howie, Graham, Camm, Thomas, Crane, Smith, Fisk, Mitchell (Turner 68), Frew, Joachim, Francis (Defty 10). Subs (not used): Peters, Weaver, Murray. Booked: Smith. Att: 932 Elsewhere Lynn Reserves reached the semi-final of the Norfolk Senior Cup with a 2-0 win at Loddon, Rory Harper scoring both goals. The draw for the semi-final takes place on BBC Radio Norfolk this Friday evening with the semi-final being played on Saturday 7 February. Lynn A won at Lynn Napier 10-0 - scorers: Watson 3, Penty 3, Howlett, Somerton, T Spittlehouse, Drawbridge.